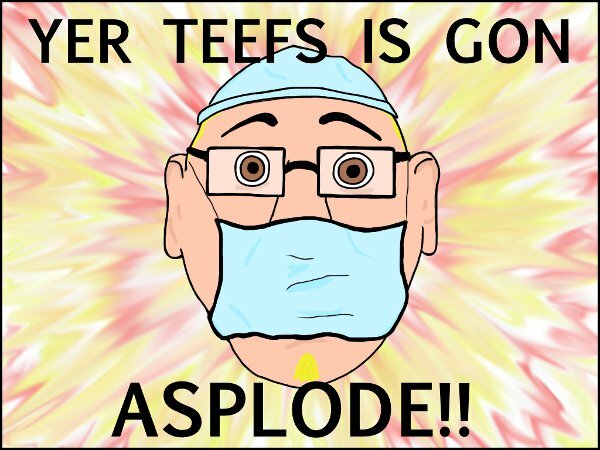 YER TEEFS IS GON ASPLODE!! I’d wanted to have this drawing done to post with the entry about my exploding teeth, but that didn’t happen. I had a few very dull meetings shortly after posting, so I went ahead and finished it anyway. So here it is. You have been warned about your asploding teefs. This entry was posted in Atomic Entry, Uncategorized and tagged dentist, drawing, humor, teeth by retrozombi. Bookmark the permalink.